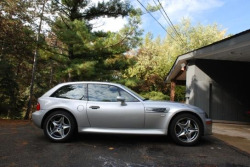 The first M Coupe Buyer’s Guide Project Coupe started as a fun experiment between Jon, Rick and myself in late September, with the intent of finding a coupe in need of some TLC, bringing it up to our exacting standards, then uniting it with a deserving owner. We didn’t anticipate it becoming an addiction, but it looks like we’ll be making a habit of it. All in all, the coupe was delivered to Jon on 9/23, brought up to what we’d call “cartel approved” status in less than a month and was picked up by it’s new owner on Friday 10/25. Time flies when you’re having fun, but I didn’t think we’d have a second project coupe so quickly. 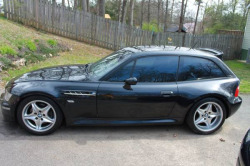 Two days later I had an email from Jon pointing me to a Craigslist ad in Phoenix saying “Seems like it would be a good one.” I clicked the link and examined five photos of a 1999 Cosmos Black over Dark Beige Oregon M Coupe. Looked to be in good shape, but with only one exterior shot and a handful of interior shots, it was tough to tell. 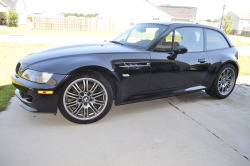 A very minimal description and an asking price of $19,000 didn’t leave me particularly impressed, until I took a closer look at the odometer photo. It read 40,849! 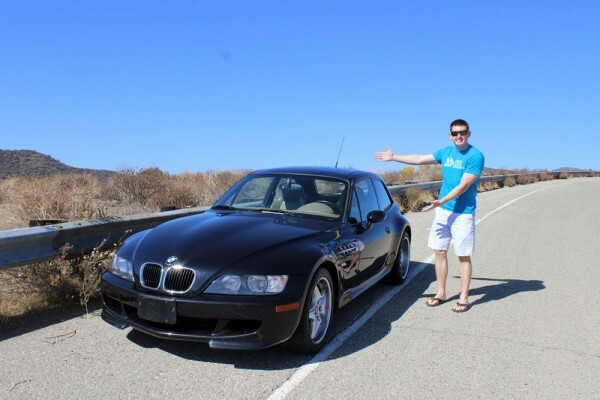 It takes a very particular or a very busy owner to only put 3,142 miles on a car per year, and every sub-50k mileage S52 coupe I had seen for sale were all asking more than this one, so I was curious what was wrong with it or if it really was a great deal. We called the number from the craigslist ad, and were greeted with “Earnhardt Nissan, this is Alex.” It wasn’t being sold by an individual owner, but by a Nissan dealership. Interesting. 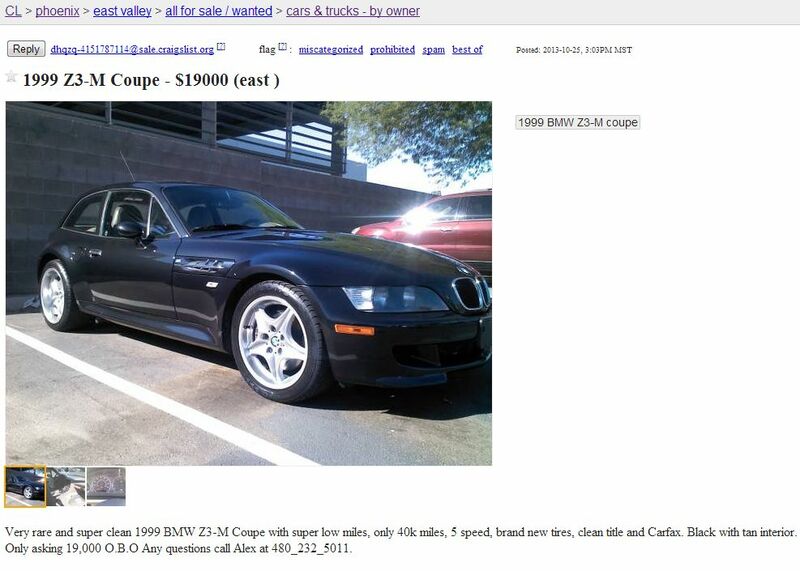 The ad was written by a salesman who had just taken it as a trade for an Altima. 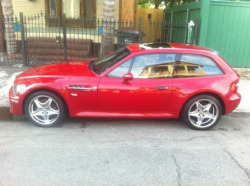 He explained it was previously owned by an older gentleman who needed more room for driving grandkids around. 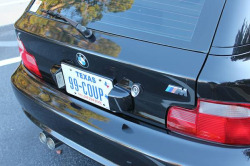 We were the first to call about the coupe, so we asked for the CarFax and any other information he could provide on the car’s history and we’d call back shortly. 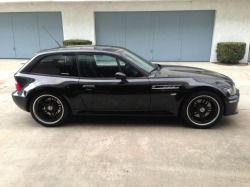 He sent over the CarFax report and about a dozen photos, mostly of the exterior this time. Exterior looked to be in great shape. No major curb rash on any of the wheels, no major body frame gaps or dents/dings that I could see. Looked mostly stock as far as I could tell, until I saw the exhaust. Definitely not stock, but no way to tell what brand. 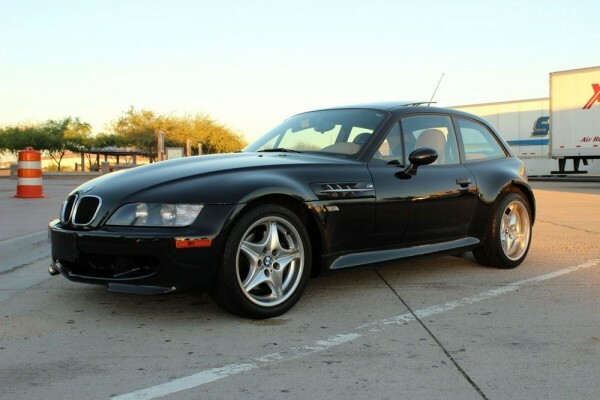 The CarFax showed up as clean with the coupe having 2 previous owners. The first owner leased it for 18 months and drove it 15,656 in Pennsylvania. 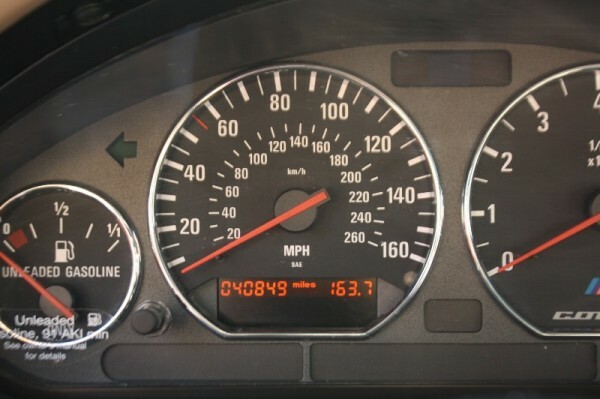 The second owner had it ever since and only put on an additional 25,193 miles in over 12 years of ownership in Washington. Wow. 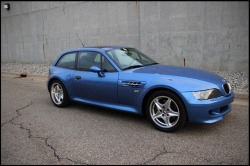 A long term owner with low mileage and a clean CarFax are all huge pluses, so we wanted to learn more. 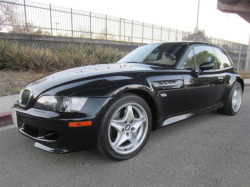 Checking the dealership website’s pre-owned inventory, we noticed they had it incorrectly categorized as a 2.8L Z3. Not uncommon, given the rarity of these cars, but that got us thinking that maybe that’s what led to the relatively low asking price. Maybe they didn’t know what they had. Or maybe there was something wrong with it, that they hadn’t shared yet. 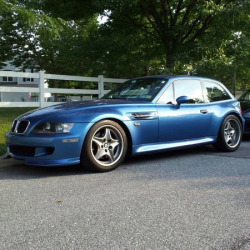 Although they have not historically been the most accurate reference for M Coupe valuation, KBB lists the value of a 40,000 mile ’99 Z3 coupe at $15,460 in very good condition, while a similarly spec’d M Coupe fetches $24,570. 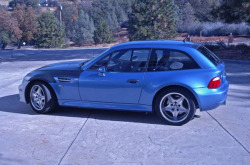 Even if the dealership knew what they had, they had still listed it $5,575 below KBB value, so it seemed like a pretty good deal unless something catastrophic was wrong with it. Alex said he’d talk to his manager and call us back the following Monday. Let’s just say it was a good enough deal to convince me to offer up my credit card right then and there for a $1,000 deposit while simultaneously booking a flight to Phoenix. I figured shipping would cost $500-$600, more for a closed carrier shipping truck, so when I saw that Delta had one-way flights for $171 from Oakland to Phoenix and the drive back home would only be about 750 miles, I decided to book tickets for my wife and I for a weekend road trip! It was a long week of anxiously waiting for our Saturday morning flight, so when my alarm woke me up at 4:00 am I was up quicker than expected. We took off from Oakland International Airport at 6:15 am, made a connection in Salt Lake City after a 2 hour layover, and finally landed in Phoenix just after noon local time. Reading that sentence makes me feel insane. Alex picked us up in a Black/Black Dodge Charger (odd, considering they’re from a Nissan dealership) but when I asked him about it his response cracked me up. “This car is the fastest one we have…except for the GT-R.” “Well, don’t forget about the coupe!” I reminded him. “Yea, but I couldn’t have picked you both up in that. Not enough seats.” The 15 minute drive felt longer than the flights. I couldn’t wait to see the car and find out what I was getting myself into. 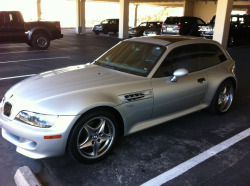 We pulled in to the lot and the coupe was sitting in a shaded spot near their service garages. Alex went in to grab the keys and I immediately circled the car. Paint looked to be in good condition, with a deep luster. Wheels were in good shape, with the driver side rear wheel being the only one with a noticeable 1″ scratch. I had replaced the windshield and driver side window on my previous coupe, so I checked to make sure all glass was PPG and/or Sekurit branded. It was. The front splitters had some scrapes, but nothing major. I found a quarter-sized ding in the passenger side door a few inches below the window and a few more smaller ones in the rear quarter panel. Nothing a good PDR guy couldn’t fix. 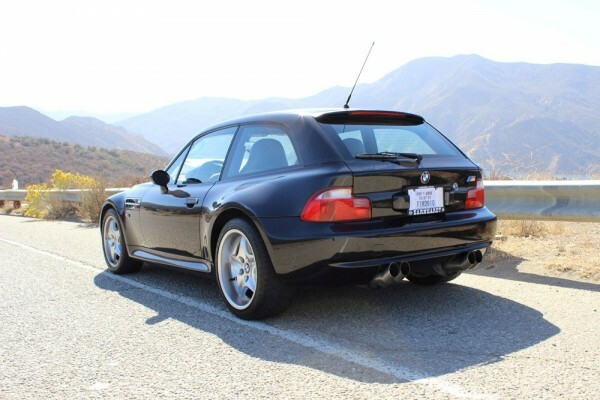 When I got around to the back of the car, I was surprised to find AC Schnitzer DTM exhaust tips. Unexpected, but cool nonetheless. Alex returned with the keys and I opened the doors, hatch and hood one by one, verifying matching VIN tags on each. The interior looked and smelled great. I love the smell of Nappa leather, and this car still smelled brand new. Very minimal wear on the driver side bolster, with supple soft leather on both seats. This was my first time seeing Dark Beige Oregon in person, and although I hadn’t liked it much in pictures, I was quite pleased with it in person. 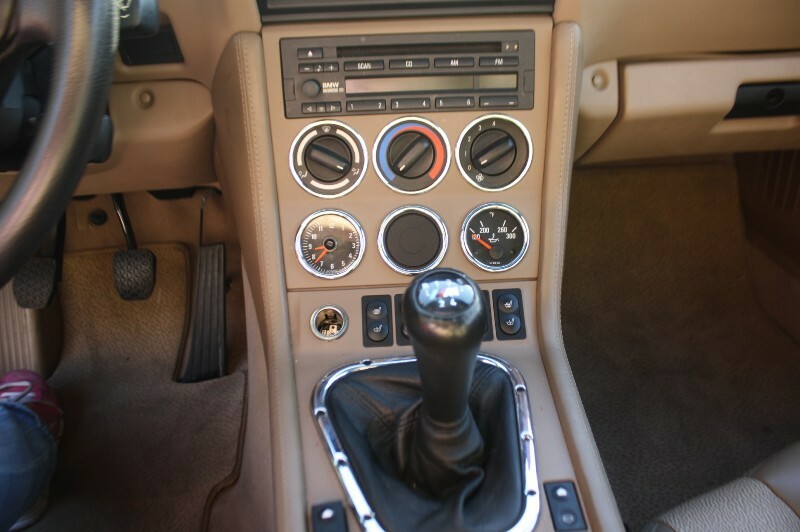 I love two-tone interiors, and while there isn’t much contrast in pictures, this is definitely a two-tone interior. The engine bay was clean and it didn’t look like anything had been modified under the hood. The rear hatch opened slowly, like my last coupe, and revealed a Noah car cover stored in the back. Sweet! I popped up the hatch floor and revealed a full toolkit, including the often missing lug nut adapter. Only thing missing was the jack, which would need to be replaced. So far, it passed the eye test. 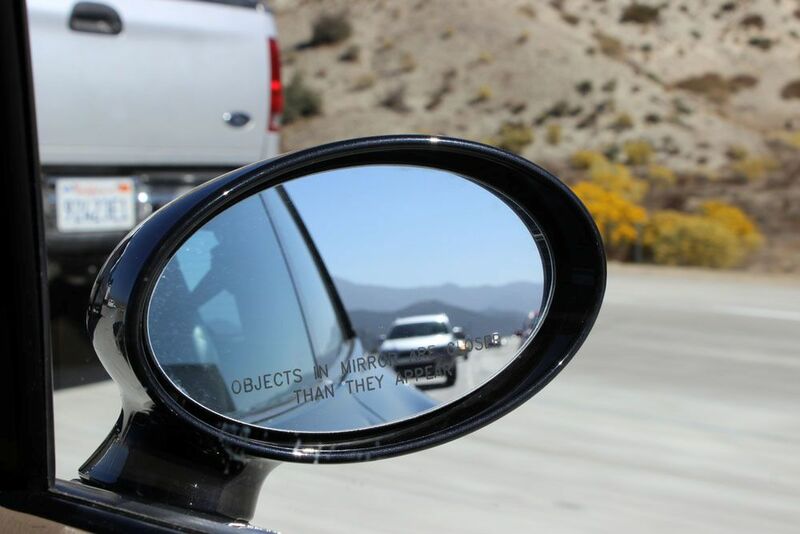 But, this car wasn’t made to be looked at. I sat in the driver’s seat, depressed the clutch and brake, turned the key and she roared to life. 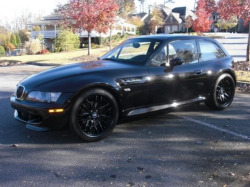 Having primarily owned and driven a S54 coupe, it wasn’t the same idle that I was used to, but it was smooth and sounded beautiful. I quickly checked the interior bulbs, front headlamps, turn signals and brake/reverse lights. All illuminated as expected. Time to take her for a drive! I found first gear smoothly and carefully made my way out of the parking lot. I had my iPhone in the center console constantly giving me voice directions back to the dealership so I could just drive wherever for 10-15 minutes and then follow the directions when I decided to head back. 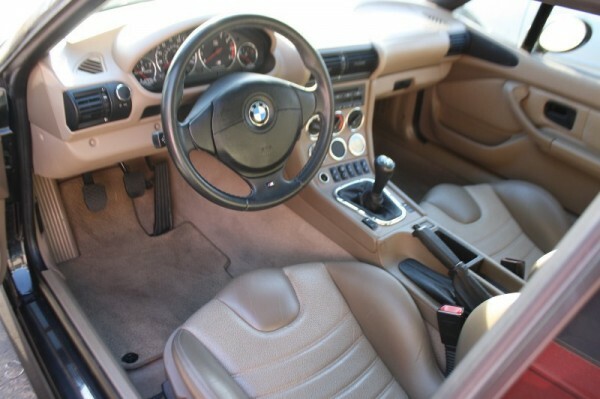 I first noticed the clutch pedal was much easier to press in that my previous coupe, a welcome change. Shifting was a smooth experience, finding each gear without issue. I was delighted to discover that after shifting into and out of fifth gear, the shifter centered back in neutral without any lean. 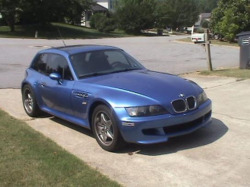 This coupe hadn’t been abused and the shift pins were in great shape. Acceleration and braking were linear, steering was crisp, and there weren’t any clunks or squeaks while going over speed bumps. I had kept the air conditioning and radio off so I could listen for any noises, but after a few minutes I started to get hot so I clicked the AC dial up to 1. Nothing. 2? Nothing. All the way up for 4? Full blast of ice cold air. Phew, at least we wouldn’t have to drive 750 miles without any AC, but it’s too bad that all the fan settings weren’t working. That prompted me to try the windows and sunroof out, and as I felt for the driver side window button, I noticed it was raised significantly higher than normal. Probably a good centimeter above the center console trim, while the other one was flush. Odd. I tried pushing it down and it wouldn’t budge. Upon closer inspection, I noticed some discoloration around the button, like it had been painted. Luckily, it worked as expected and both windows went down fine. Sunroof opened and closed, too. I took a few tight turns and highway onramps with delight before making my way back to the dealership. I brought it into the service bay and got it raised on the rack. 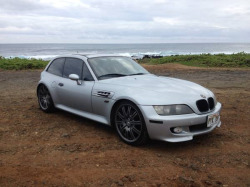 The only thing left that would keep me from buying this could would be a cracked subframe or differential mount. I borrowed the technician’s flashlight and closely examined every weld and every curve of the mount. It was pristine. Guibo looked good from what I could see. All in all, the undercarriage was dry, clean and rust-free and I had no doubts about taking this coupe home with me. 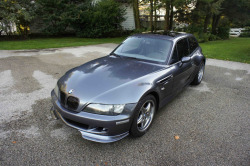 After some paperwork and some handshakes, the coupe was ours. We left the dealership shortly before 3 pm with the goal of reaching Los Angeles by 8:30. One of my buddies from college lives outside of LA and offered us a place to crash, so I didn’t want to keep him waiting too long. From Phoenix to Los Angeles, it’s a straight shot heading west on I-10. I was a bit anxious taking this new-to-me coupe on a 750 mile road trip just a couple hours after laying eyes on it, but we were off. One thing I noticed right away was I got a LOT more looks, stares and thumbs ups in this coupe compared to my silver S54. 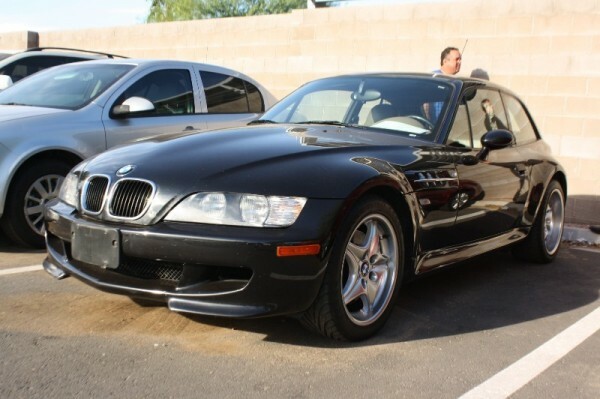 I might have even gotten more looks on the 45 minute drive out of Phoenix than I ever got in the last coupe. 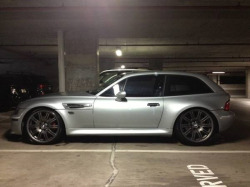 That’s what drew me to the M Coupe if the first place. It’s a lot like nothing else. The route we took is actually the same route my wife and I took when we moved from Austin to San Ramon, so when we saw an eerily familiar rest stop we had to pull over. I recently bought my wife a new Canon T3i DSLR, and she used the drive to read through the instruction manual. Exciting. This was the first photo we took of the coupe. The rest of the drive was directly facing the sun, which was bearable for me with polarized Oakleys. The sun visors in the coupe are hilarious, and probably only there by law. After filling up with gas just outside of Phoenix, we made it another 280 miles until the gas light came on. We pulled over in Cabazon, CA for a fill up. Gas prices were noticeably elevated (or back to normal, if you’re a CA native). The last hour into LA was tough, because we were both starving. There were a few sketchy places that we contemplated, but once we found a Chick-Fil-A on Yelp, we held out. Heaven. The stay in LA was quick, and nice to catch up with an old friend, but we still had another 5-6 hours of driving ahead of us, so we headed out early Sunday morning, grabbed breakfast at a local diner, and settled in for the last leg of our journey. Cops everywhere! I just recently got my 3rd speeding ticket of 2013 (4th ever) and I couldn’t afford another one, so I made cruise control my friend. Unfortunate, because it takes so much fund out of the driving experience, but necessary. We made it onto I-5 N, which is admittedly the most boring way to drive from Los Angeles to the Bay Area, but we didn’t have the time for PCH. 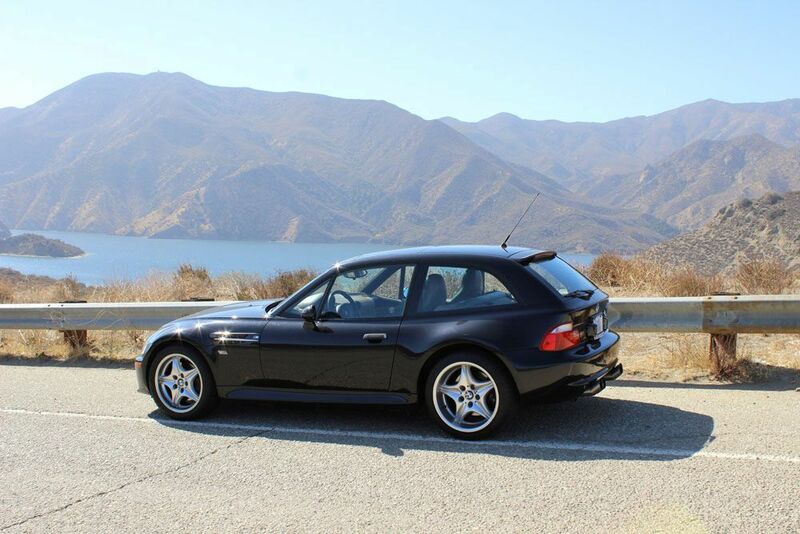 Here’s a shot of the coupe at the last vista point in the mountains. I took a similar shot of my original coupe when I drove it from San Diego to San Ramon. Then, we were out of the mountains. Truth is, there isn’t much difference between central California and west Texas. Flat, boring, dusty and the occasional oil derrick. Stay tuned for our next article where I’ll introduce you to the guys at Performance Technic, my independent shop of choice. Only then will I really know what I got myself into.